China on Friday accused the United States of starting "the biggest trade war in economic history" as the two sides imposed steep new tariffs on tens of billions of dollars of each other's exports. 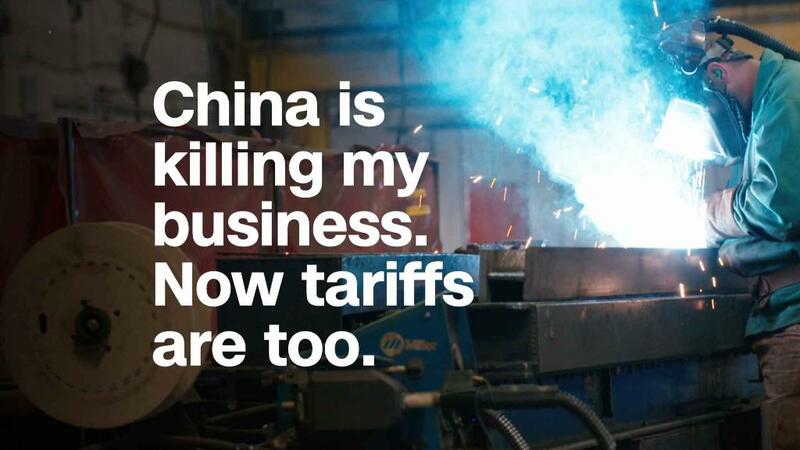 The Trump administration's 25% tariffs affect more than 800 Chinese products worth $34 billion such as industrial machinery, medical devices and auto parts. They kicked in just after midnight ET, which is noon in Beijing. 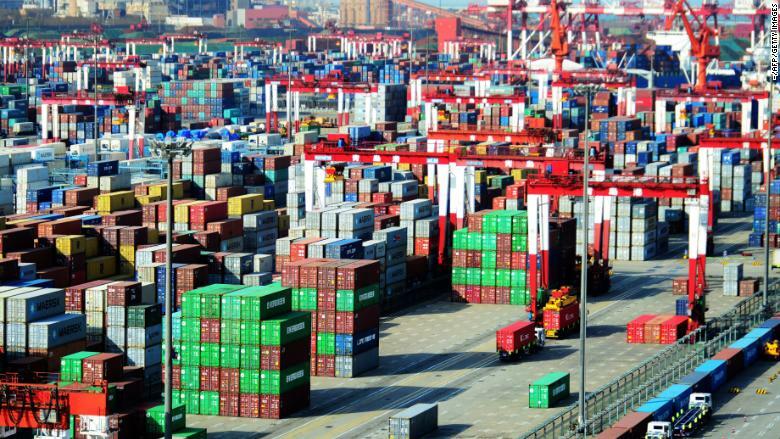 China's tariffs on US goods came into effect immediately afterward, a spokesman for the Chinese Foreign Ministry said Friday. "China is forced to strike back to safeguard core national interests and the interests of its people," the Commerce Ministry said in a statement on Friday. 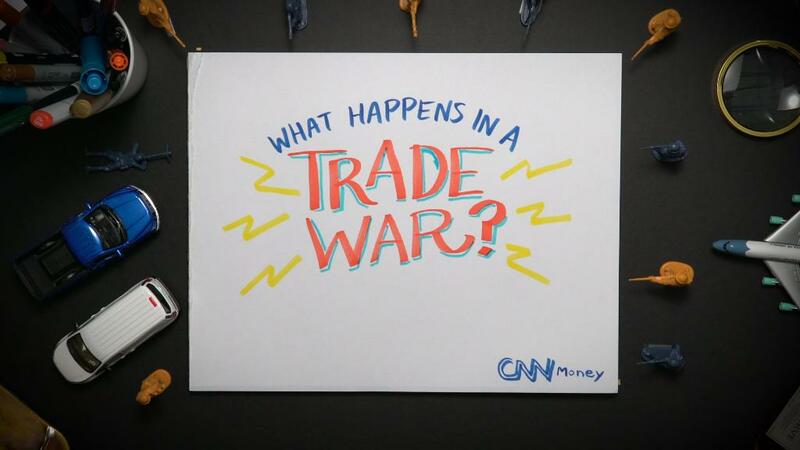 It accused the United States of "typical trade bullying." The government said previously it would hit more than 500 US export items — including cars and major agricultural goods such as soybeans and meat — worth the same as the Chinese products targeted by the United States. Even before Friday, the trade dispute between the world's top two economies had rattled markets and prompted warnings from companies of damage to their bottom lines and higher prices for consumers. American companies doing business in China are particularly worried. Shipping containers at a port in Qingdao, China's eastern Shandong province, on April 13. 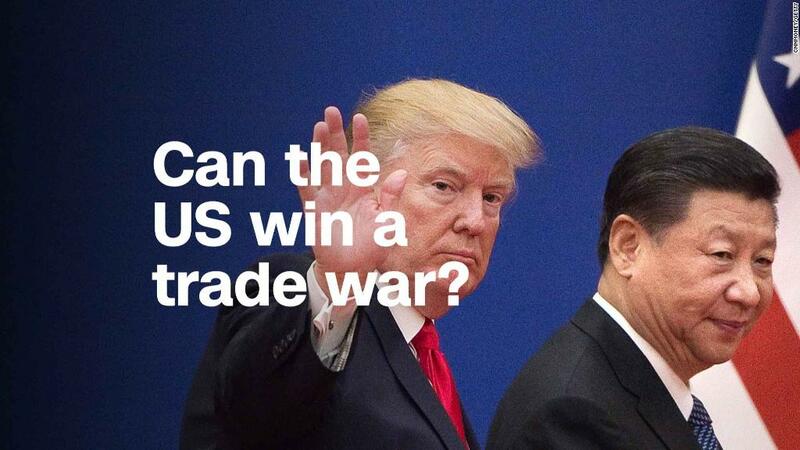 The United States is also set to impose 25% tariffs on another $16 billion in Chinese exports later in the summer, and China has vowed to retaliate against US goods worth a similar amount. Economists say that if the back-and-forth stops there, the overall impact on both economies will be minimal even though some industries will suffer. He described the potential escalation to reporters aboard Air Force One: "Thirty-four, and then you have another 16 in two weeks and then, as you know, we have 200 billion in abeyance and then after the 200 billion we have 300 billion in abeyance. OK?" Trump said. "So we have 50 plus 200 plus almost 300." 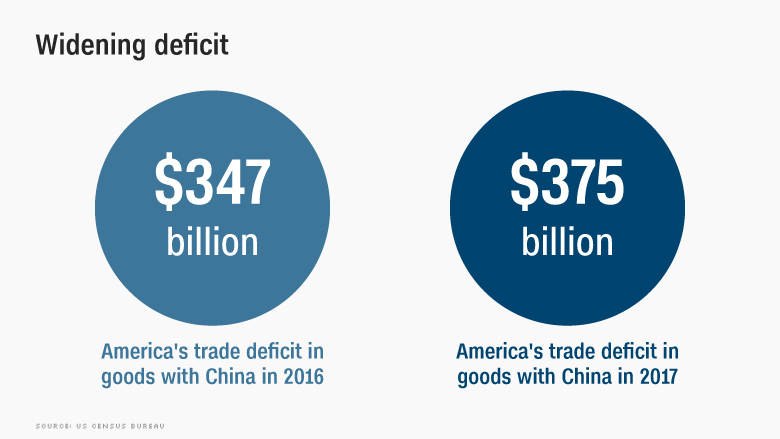 That amount is higher than an earlier threat from Trump to target as much as $450 billion of Chinese exports. It's also bigger than the $506 billion of goods that the United States imported from China last year. "We urge the two governments to come back to the negotiation table with the aim of having productive discussions based on achieving results -- focused on fairness and reciprocal treatment -- instead of escalating the current situation," said Zarit of the American Chamber of Commerce. 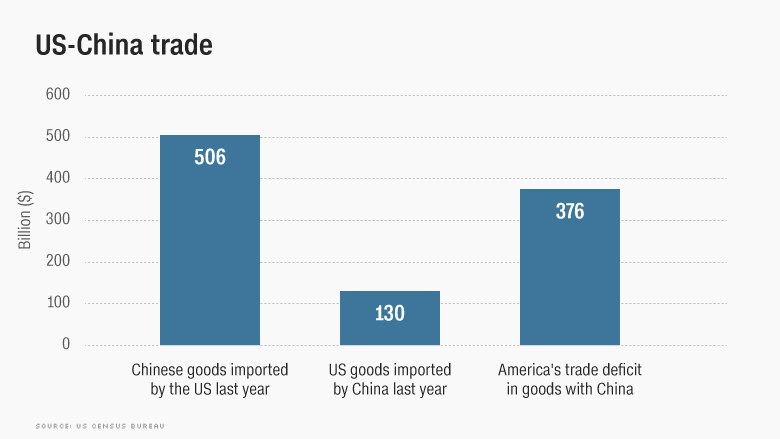 Despite three rounds of negotiations between the two sides, including a Chinese pledge to significantly increase purchases of American products, Trump decided to go ahead with the tariffs. The clash with China comes as the Trump administration is also fighting over trade with American allies such as Canada and the European Union. US tariffs on steel and aluminum imports have provoked retaliatory measures against billions of dollars of American exports. Trump has added to the tension by threatening new tariffs on cars. 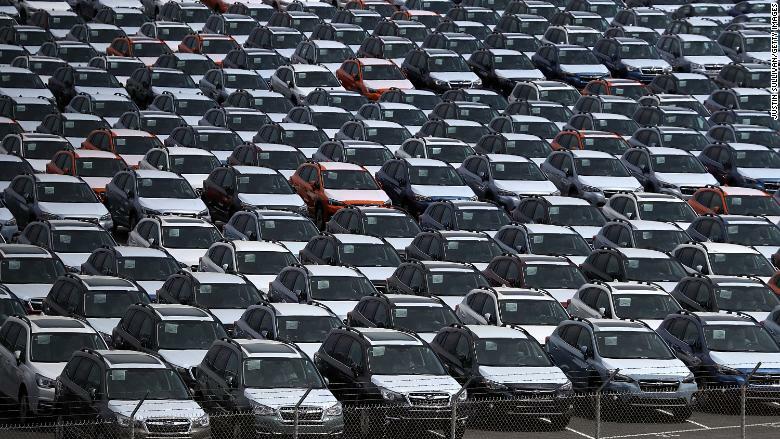 Brand new cars sit in a lot at the Auto Warehousing Company near the Port of Richmond on May 24 in Richmond, California. "By threatening unilateral action without having any allies and not reducing domestic discord on trade, the Trump administration has invited China to stand tough," said Scott Kennedy, director of the Project on Chinese Business and Political Economy at the Center for Strategic and International Studies. "The Trump administration also believes that at least starting a trade war is in its interests; the US economy is strong enough to endure a crimp in trade, the president's domestic political standing is as strong as ever amongst Republicans, and pushing China hard on trade may help restore US credibility on other issues," he added. The two giant economies appear ready to see which side can endure the most pain. The damage could also spread to other economies, hurting business confidence and prompting companies to delay investments. Kennedy say he thinks the Trump administration's enthusiasm for the conflict "will erode as the economic pain and political fallout from a trade war begin to take hold. At that point, the US will be more interested in negotiations, and the Chinese side will also want to come to the table." But reaching a deal that's palatable to both sides will be tough. For example, the US government wants China to rein in government subsidies for policies like "Made in China 2025," which seeks to pump hundreds of billions of dollars into industries such as robotics, electric cars and computer chips with the aim of becoming a global leader. "It's still hard for me to believe the Trump administration could develop and negotiate an overarching package with China that genuinely sticks," Kennedy said. "And so I'd expect the two sides to pursue some sort of face-saving deal that looks good on paper but is not enduring." -- Steven Jiang and Kevin Liptak contributed to this report.